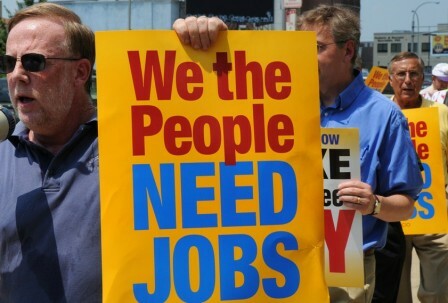 How will North America create jobs? Some call for the retraining of displaced workers. Others favor apprentice programs or skills training. Some want the effort to start with post secondary education. In Detroit, Michigan, where the need is as acute as anywhere, all of these approaches are used. Colleges and charity organizations have pioneered ways to help the jobless. Bloomberg looks at models developed to help the jobless find work, and examines some studies that measure and compare how well they work. Can Retraining Give the Unemployed a Second Chance? Americans looking for employment often lack the skills they need. Retraining works. Sometimes. Consumer demand for increased variety is especially big in the food and beverage industry and virtually all producers want to increase productivity. RIA’s Food Robotics webinar (September 29, 2011, Noon EDT) examines core issues, including safety and quality control, so that you can quickly understand limitations and opportunities offered by robotics. If you are not an expert on robotics, this webinar allows you to start at the beginning and gain a basic understanding of the technology. As you consider robotics for food and beverage applications, it pays to look at vision systems for inspection and traceability. Like peanut butter and jelly, robots and machine vision often go together. Something that doesn’t go so well together are people and cold, damp environments. Robots, though, can work all day in a humid, refrigerated setting. Harsh wash-down conditions need not be a concern either. Increasingly there are robots and end effectors built to withstand all these factors. The webinar is free of charge and covers. . .
Robots offer flexibility for faster changeover times; they can speed up line times and even handle more than one line simultaneously. Whether you are concerned about ergonomics, traceability, quality or throughput, this RIA webinar is a great starting place to learn the facts about robots for the food and beverage industry. Register today! ATI Industrial Automation recently hosted its 5th Annual Open House and Technology Training Fair at its Detroit, Michigan office on August 18. The event was a huge success, with a large turnout of guests representing a wide variety of industries and markets. New Product Developments: A look at the latest advances in robotic end-effectors and their applications that ATI has developed over the last year, including Utility Couplers, Through-Hole Tool Changers, Robotic Tool Changers used in special environments, Tool Changer Utility Modules, Force/Torque Sensor products, and a brief look at products currently under development. Solutions – How Customers Are Using ATI Products: Specific application examples of how customers have benefited from ATI products. Presentations from customers that have actually used our products in unusual applications! Presentations by KUKA Systems – Tool Changer deployment in aerospace robotic applications, Valiant – Industrial parts washer utilizing Tool Changers, Thierica – Advancements in paint system design using Tool Changers, and Kaufman – Tool Changers utilized in packaging systems. Product Selection and Website Navigation: Making the most of ATI’s website for product and module specifications, drawings, and models. Everything you ever needed to know and more! Bus Networks for Tool Changers: Trends in Automotive Tool Changer applications with an overview of current bus network types, their advantages and disadvantages, and ATI Tool Changer products that support these network standards. Emphasis on “Quick Connect” for Ethernet and PROFINET. Presentations by Siemens, Rockwell, Turck, and Molex. During the open house and only a few blocks away, AMT and Adaptive Systems joined forces with ATI and hosted their own open house with a variety of live large robotic demonstrations with ATI products. 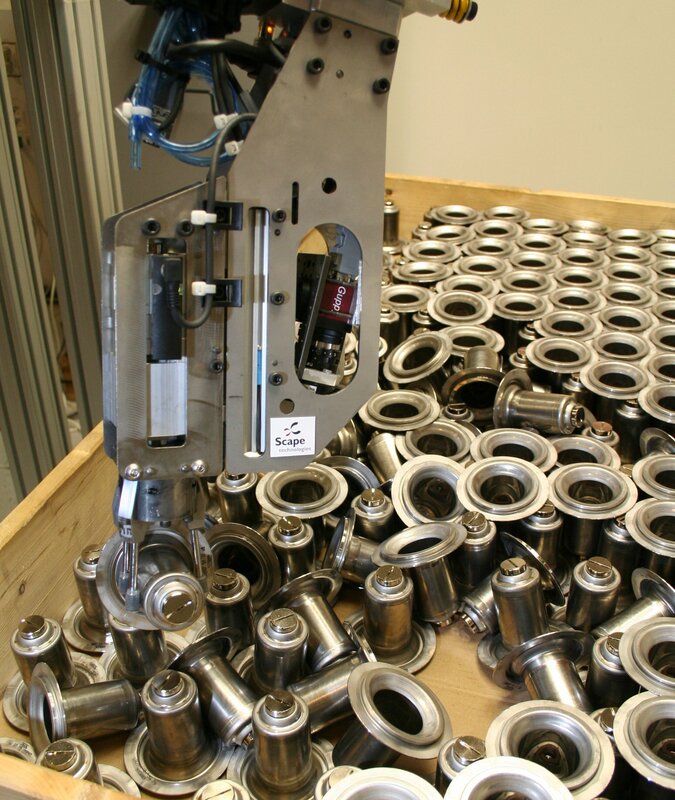 These included a flexible, two-robot cell utilizing ATI Tool Changers and a turnkey system performing structured, robotic bin-picking of brake rotor castings, also with ATI Tool Changers. Shuttle service between locations was available all day. If you missed the event and would like to receive a copy of the presentations CD that covers all of the training topics that were discussed, please contact ATI at info@ati-ia.com or 919-772-0115. 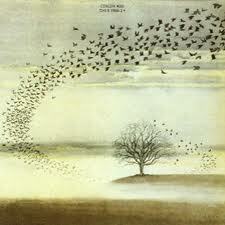 By Adil Shafi, President, ADVENOVATION, Inc.
“Wind and Wuthering” by the music band Genesis. When considering random picking, it is appropriate to begin with two facets of the natural world and our human life. Doing this gives us a basic understanding of the process and helps us draw relevance in the manufacturing setting. First, the world is filled with entropy, or disordered order, or alternately, ordered disorder. As an example, no two trees are identical yet trees of the same kind look similar. In the autumn, leaves do not fall in a rectangular grid pattern; they look similar but they are uniquely different and when they fall, they fall in a random order driven by the forces of wind and gravity. In a similar manner, it is natural to have parts made in a stamping machine or a die cast to fall in a heap in a bin in random order. By virtue of gravity, they do not fall in an ordered geometric pattern. Thus, entropy and randomness are integral in our natural world. We as human beings find it naturally easy to see objects in an unordered environment and then to touch or pick them. We do it many times each day; often without even thinking about it. “Bin Picking Shape Variant Food Bags” Courtesy of Adept Technology. In the manufacturing business, presentation of parts to robots for handling or assembly creates cost, tooling and maintenance. It is ideal to be able to acquire parts, resting naturally in varied forms of random order, from bins, trays, totes, racks, etc. thereby saving multiple costs. “A bin filled with automotive piston heads” Courtesy of ADVENOVATION, Inc.
For 25 years, technology and the complexity of the task in geometry, lighting, shadows and occlusion have evaded success and frustrated a lot of attempts. In 1986, Professor Berthold Klaus Paul Horn at MIT wrote in his famous book Robot Vision1 “One of the remaining obstacles to the widespread introduction of industrial robots is their inability to deal with parts that are not precisely positioned,” and he went on to offer several computational and practical ideas to make bin picking possible. Many who worked on bin picking in the 1970’s and 1980’s turned their attention to applications for the Internet and security in the 1990’s and 2000’s. But, now in 2011, there is newfound success for bin picking in the manufacturing industry. Mechanistic, electrical or computational breakthroughs that make bin picking possible or easier are called “bin picking enablers.” Especially significant are advancements in lighting, sight, computation and adoption of robotics. Today, lighting is more flexible. Cameras have higher resolution. Computational processing power is staggering, and we have new mathematical algorithms for three dimensional (3D) bin picking object location. Other important enablers relate to part handling techniques including part separation, and robot grasping techniques. “Axle Shafts in Powertrain” Courtesy of Motoman Robotics. use of PCs for business and personal use has spurred computational processing power. 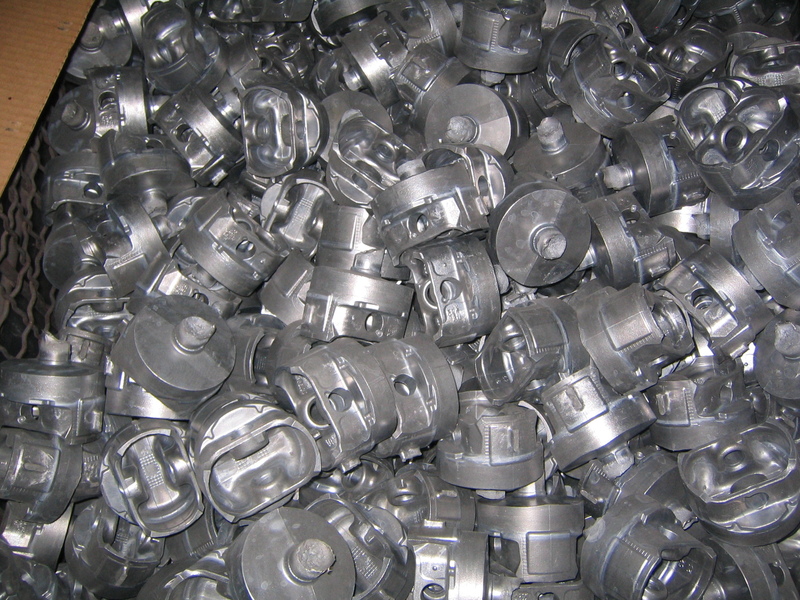 Part handling techniques such as magnets, air, vibration, gravity and multistage control for precise part control have been extensively used. 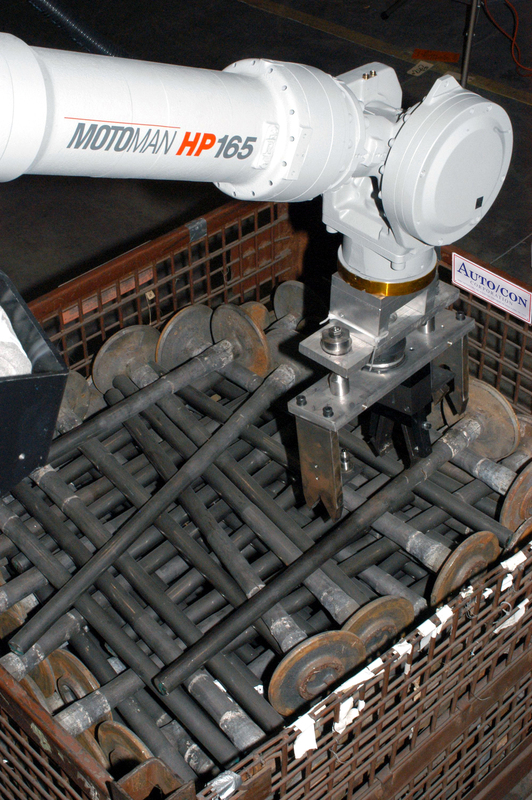 Robot grippers have improved in sensitivity, versatility, speed and compliance. Bin picking is challenging because there are 1) many types of geometries in the parts that are attempted to be bin picked, and 2) they occur in bins with various degrees of structured, semi-structured or random order. These constitute much of the activity in innovation in bin picking in 2011. “Bin Picking Unordered Objects” Courtesy of Scape Technologies. There has been no “magic bullet” or technique to solve all geometries for bin picking. Rather a collection of algorithms has emerged that have progressively solved an increasing number of classes of geometries, arranged in a progressively increasing level of randomness. This trend is expected to continue with additional bin picking Enablers in the future e.g., the design of custom VLSI chips to perform current software techniques more quickly in hardware. Color and light handling techniques are expected to provide more viable candidates amongst heaps of random parts for bin picking. Material handling techniques derived especially from space, surgical and rehabilitation handling experience are expected to make bin picking more flexible, versatile and fault tolerant. In 2011, structured or semi-structured bin picking (in which parts are staggered or skewed but not completely random) is currently in the third “emerging” stage. Random bin picking (in which parts are completely randomly placed) is currently in the second “leading edge” stage. Both areas are destined to improve in the future. Powertrain (engines, cylinder heads, axle shafts, differential carriers, pinions, round parts with stems, connector rods, piston heads, brake rotors and stacks of gears). Stamping (flat or bent metal plates with multiple holes, stacked stampings with a progressive skew). Final Assembly Products in Boxes in car assembly (trim chassis final) pick operations for placement into cars on moving lines. Strips of medical tablets, flat but randomly arranged in boxes. Bags of products e.g., chips, salsa, cheese, cement, etc. Lateral or upright layers of tubes (copper, plastic, PVC). Layers of products e.g., wooden planks, plastic sheets. 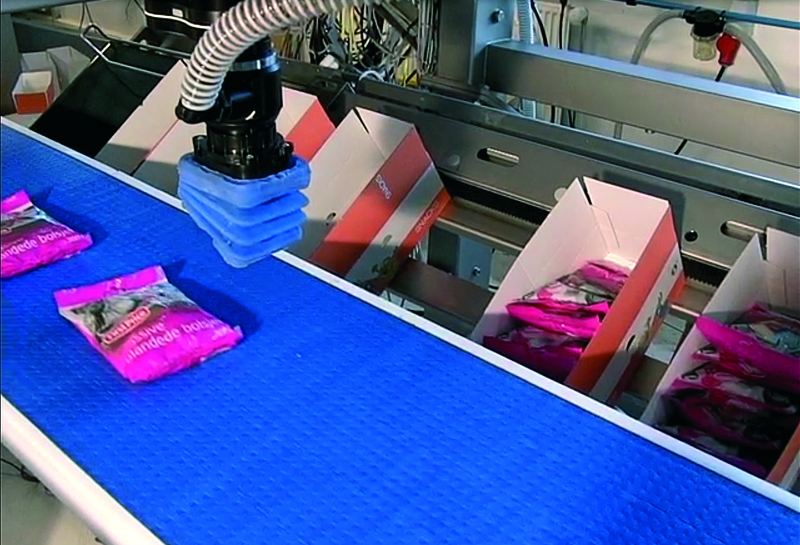 In the last five years, a growing set of successful installations and subsequent citation in industry press and demonstrations at trade shows has reinforced the appeal and growing confidence in robotic bin picking. “Bin Picking Hub Caps” Courtesy of Fanuc Robotics. More innovation is on the way, spurred by Internet connectivity, more powerful computation libraries in open source or from proprietary suppliers, and of course, the motivation of financial benefit derived through overcoming entropy in our natural world. This points the way to solving the bin picking problem, for which there is no known theoretical computational impediment, completely by 2020, a number synonymous with perfect vision, if not before. This is my conviction and prediction. Robot Vision by Berthold Klaus Paul Horn, © 1986 by the Massachusetts Institute of Technology. Artificial Vision for Mobile Robots Stereo Vision and Multisensory Perception by Nicholas Ayache, © 1991 by the Massachusetts Institute of Technology. 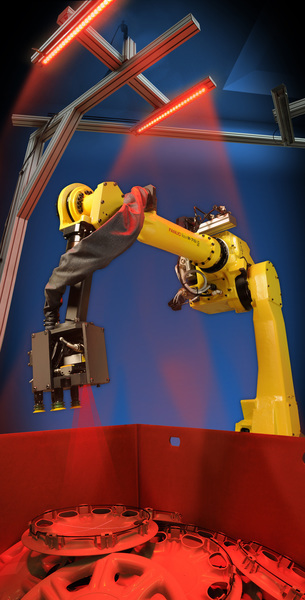 Robotics Online, http://www.robotics.org/content-detail.cfm/Industrial-Robotics-News/How-to-Implement-Bin-Picking-in-your-Manufacturing-Operation/content_id/1787 in April 2007 by Adil Shafi. Adil Shafi is President of ADVENOVATION, Inc., specializing in software solutions and innovation in the field of Vision Guided Robotics (contact adil@advenovation.com or visit www.advenovation.com). You are currently browsing the Robots in America blog archives for September, 2011.